I look forward to your posts on music nearly as much as on your writing. You would make an excellent music critic, imo. And you've got me into a couple of bands I never knew about, Ladytron chiefly among them. 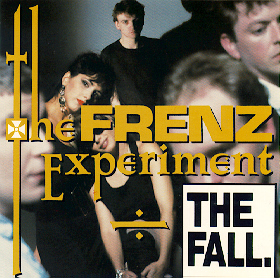 Now I get to check out the Fall, another band I knew nothing of. Sad to hear about his Smith's passing. Too young but his output was prolific, all things considered. And vice versa, Al! Your presence on FallNet led me to your excellent books, of which I have now read many! Cheers and let's raise a glass to Mark. Mildly curious as to how you would hook up with a stray member of the Fall back in those pre-internet days. But, more pertinently - you gave him a lift and he didn't put you on the guest list! Think we talked about the Fall the first time we met and I can't say I've shifted much from my 'too scared to go there' position. But I do own more Fall tunes now than I did then (2 albums and one compilation), not least because I legally downloaded 'Infotainment Scam' to put your Fall pick in the podcast we did at the time. Sorry, Al, seem to have lost a bit of that post - but it was a nice tribute. Listening to This Nation's Saving Grace as I type. This was back in 1999 so not exactly pre-internet. How it came about is slightly convoluted but the sister of a friend of mine (from the Fall mailing list) was involved on some level in the booking of the tour, if I remember rightly, from the Dutch venue side of things. I don't remember if I was offered a ticket for that night but more than likely I'd have declined as it was a long drive back and I was in the middle of edits, so I think I was more than willing to settle for seeing them on the subsequent dates. I played TNSG last week, still a really fab record. Really a nice piece of writing. Also a MAJOR fan and will miss him terribly.